Since G-8 and his Battle Aces have proven to be the most dangerous opponents of the Central Powers Amed Ghezi and his lycanthropic shock troops are called to the Western Front to eliminate our heroes once and for all. G-8, Bull Martin and Nippy Weston have survived mummies, walking skeletons, headless zombies and intelligent gorillas but will these supernatural foes be their downfall? Find out amid dogfights, gunfights, fist-fights and desperate battles with savage wolf-men on land and in the skies over No Man’s Land! G-8 winds up bitten by one of the man-wolves and must undergo emergency treatment at a crucial point in this macabre story. Plus the Central Powers devise a method of seeing through our hero’s disguises! 35. VULTURES OF THE PURPLE DEATH (August 1936) – This thrilling G-8 tale is often held up by the fans as one of the best for cinematic treatment. I personally disagree but it does have a lot of action and thrills. G-8’s archenemy Doktor Krueger is back! This time the mad genius has devised a deployable purple fog that is so thick and opaque it blinds all of the Allied ground and air forces enveloped in it. This blindness leaves them at the mercy of Central Powers troopers who wear face masks designed by Doktor Krueger to let them see in the purple fog. Countless Allied soldiers and pilots are mercilessly mowed down by these troopers, who also use the fog as cover to kidnap and torture American commander General Black Jack Pershing! G-8, Bull and Nippy must recover Pershing and try to lay their hands on some of Krueger’s masks so that Allied scientists can mass produce them for their own forces. But is there more to Krueger’s plans than meets the eye? 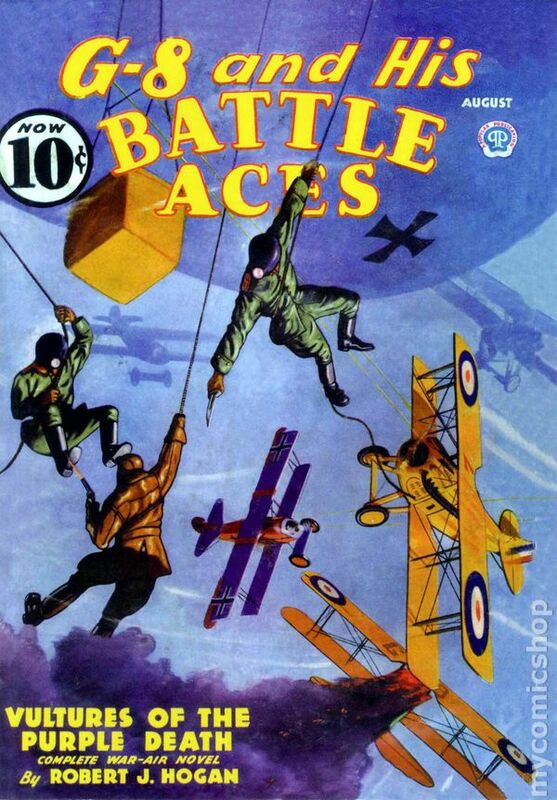 One of the action set pieces in this epic tale finds G-8 dangling from a German Zeppelin’s trailing rope while trying to fight his way onto the aircraft against masked men hanging from the other trailing ropes (see cover above left). Oh, and by the way G-8 found himself in that position after getting shot down and then LEAPING from his plummeting plane to desperately clutch at the rope. All this plus a daring escape in a commandeered German tank and G-8 face to face once again with rats – his version of Indiana Jones with snakes. 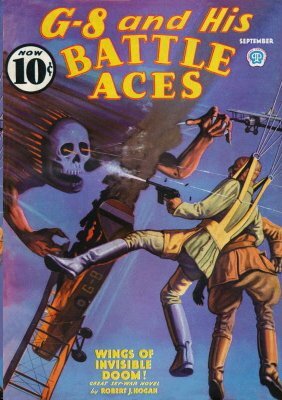 One of the side-issues in this tale is the clash between G-8 and the fictional General Dawson, who takes over for Pershing during his captivity and recuperation after being rescued. Dawson is a hard-nosed by-the-book jerk who jeapordizes the attempts of our heroes to thwart Doktor Krueger’s fiendish plans. 36. WINGS OF INVISIBLE DOOM (September 1936) – This is it! The story that kicked off what will be a big trend in future G-8 adventures: SUPERVILLAIN TEAM-UPS! 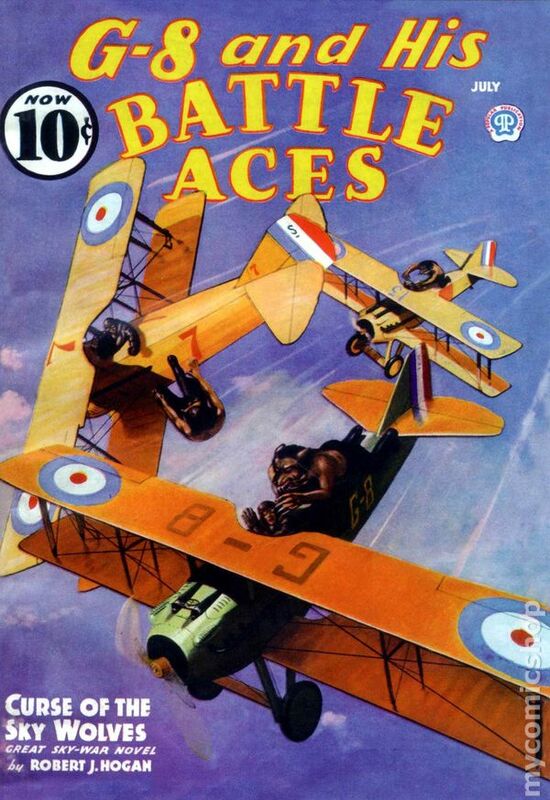 Yes, various combinations of G-8’s Rogue’s Gallery of foes will join forces to try to accomplish what they couldn’t do individually, namely kill G-8 and his Battle Aces plus win the war for the Central Powers. For this opening salvo we get perennial bad guy Doktor Krueger working in conjunction with a brand-new villain named Ghoula. Like G-8’s earlier foe Lakurji, Ghoula is a Hindu man who wants the hated British Empire out of India. He’s thrown in with the Central Powers in the hope that they can defeat Great Britain and the other Allied Powers, then give him India to rule. The plan he and Doktor Krueger have hatched is a hybrid of Krueger’s deadly flying machines and Lakurji’s invisibility spell. This cloaked craft is called the Invisible Doom and sports a gigantic Death’s Head as a cockpit for its psychological effect when the plane de-cloaks. This story is not the greatest Supervillain Team-Up in the G-8 series, but it established the soon-to-be tradition. G-8’s 1917 Cadillac Roadster makes another appearance in this tale but gets stuck in the mud between Le Bourget and Paris and must be temporarily abandoned. I WILL BE EXAMINING MORE G-8 STORIES NEXT TIME! Thank you, that’s nice of you! I love anything with Dr Krueger! I love arch-enemy stories, too! I think the Sky Wolves should have been recurring foes! yeah, you could have had “Return of the Sky Wolves” , “Revenge of the Sky Wolves” etc. Well,Vultures of the purple death was the best one in there. The Sky Wolves sounds like a sports team.